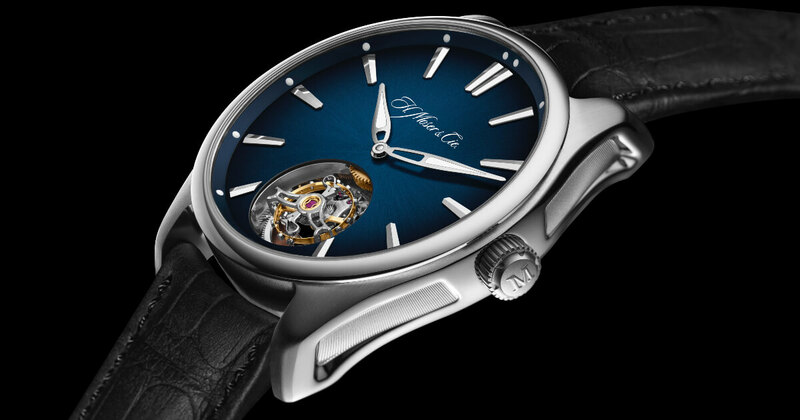 A flying tourbillon equipped with a double hairspring, designed for everyday wear, offering a 3-day power reserve, in a steel case water-resistant to 120 metres: the Pioneer Tourbillon model from H. Moser & Cie. is one of the few tourbillons which can be worn, with great elegance, in any circumstance. H. Moser & Cie. is blending genres, offering a sporty reinterpretation of the tourbillon, a resolutely modern and contemporary version of the traditional complication par excellence. The Pioneer collection has a bold, modern look – the mark of a pioneering and adventurous spirit, with a strong design which makes reference to the industrial world. Topped with a domed sapphire crystal, the case features structured sections on the sides – a modern reinterpretation of the unusual non-geometric shapes which famously adorn the sides of other H. Moser models. The same structure is also found on the screw-in crown, engraved with the letter "M". Hardwearing and water-resistant to 120 metres, this 42.8-mm steel case protects the complex heart of the Pioneer Tourbillon. The self-winding HMC 804 Manufacture calibre is visible behind the skeletonised bridge of the minute tourbillon. 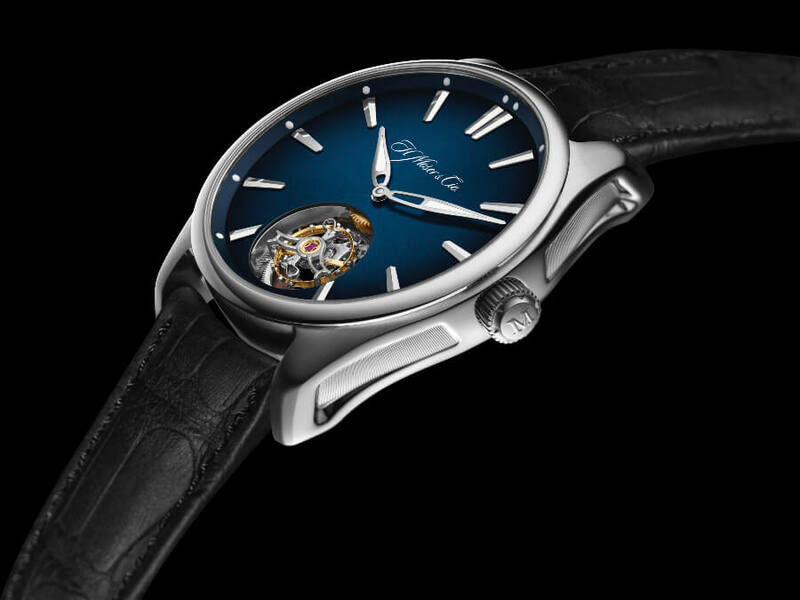 Powering this movement, the oscillating weight transfers the energy to the barrel via a bi-directional pawl winding system which reduces the time required to fully wind the watch. 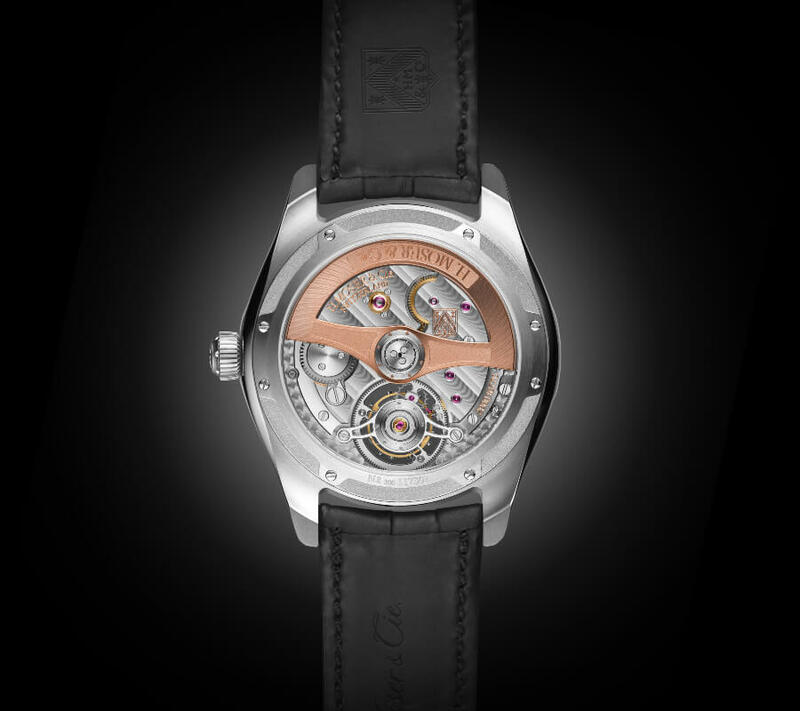 Made from 18-carat solid red gold, the oscillating weight is skeletonised to reveal the mechanism beneath. A marvel of ingenuity, this HMC 804 calibre is equipped with a double flat hairspring designed and produced in- house. Thanks to this pair of matched hairsprings, the movement of the point of gravity on each spring when it expands is corrected, significantly improving accuracy and isochronism in continual pursuit of perfection. In addition, the paired hairsprings also reduce the effect of friction normally experienced with a single hairspring, improving isochronism. Finally, the tourbillon's unique design makes it an interchangeable module, assembled and regulated independently of the movement via a simple plug and play system which allows easy servicing. This result is a tourbillon better adapted to the needs of early 21st century users, for a modern era in which we jump from work to the gym, then home to family for yet more activities, with little time to relax. 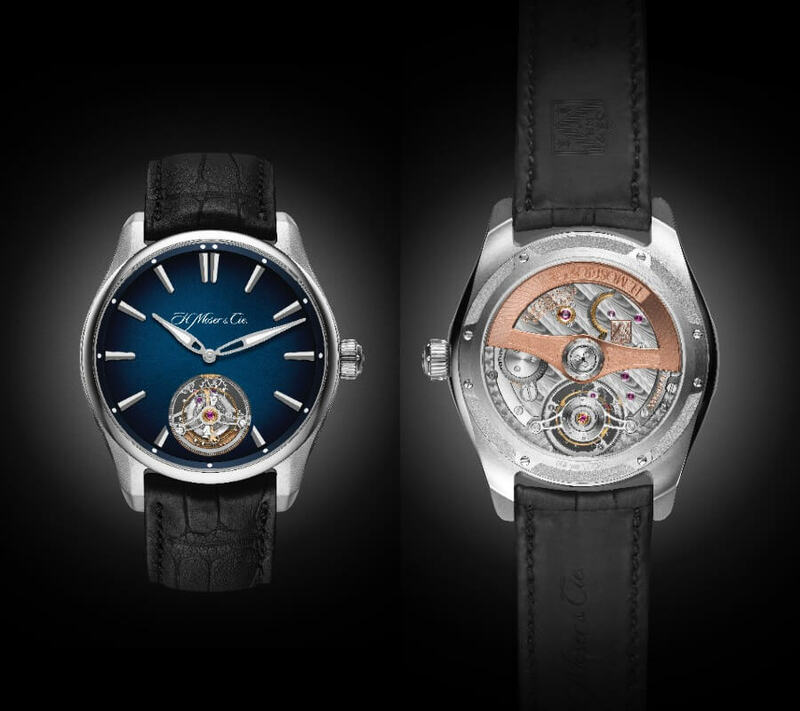 The Pioneer Tourbillon perfectly steps up to these new requirements, combining style with practicality. 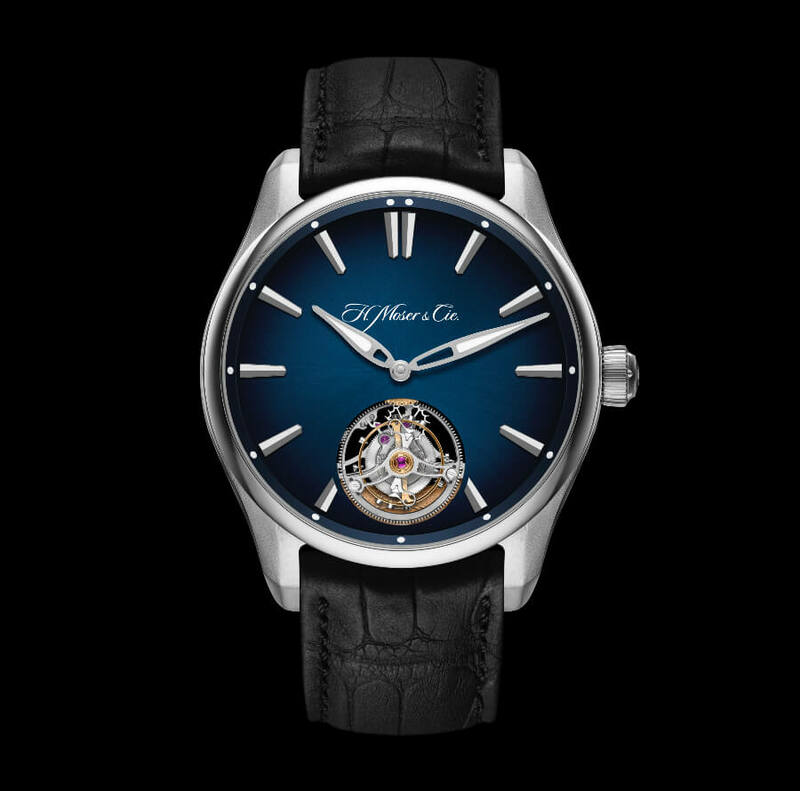 On one side, the Pioneer Tourbillon features the mesmerising H. Moser & Cie. midnight-blue fumé dial. The luminescent points dotted around the flange and the hands filled with Superluminova allow the display to be read at any time of day. For the strap, H. Moser & Cie. chose black alligator leather, which reinforces the elegant and timeless nature of this model. The Pioneer Tourbillon is one of the new products which will be presented at SIHH 2019 in January, but it will be on sale from October 2018. 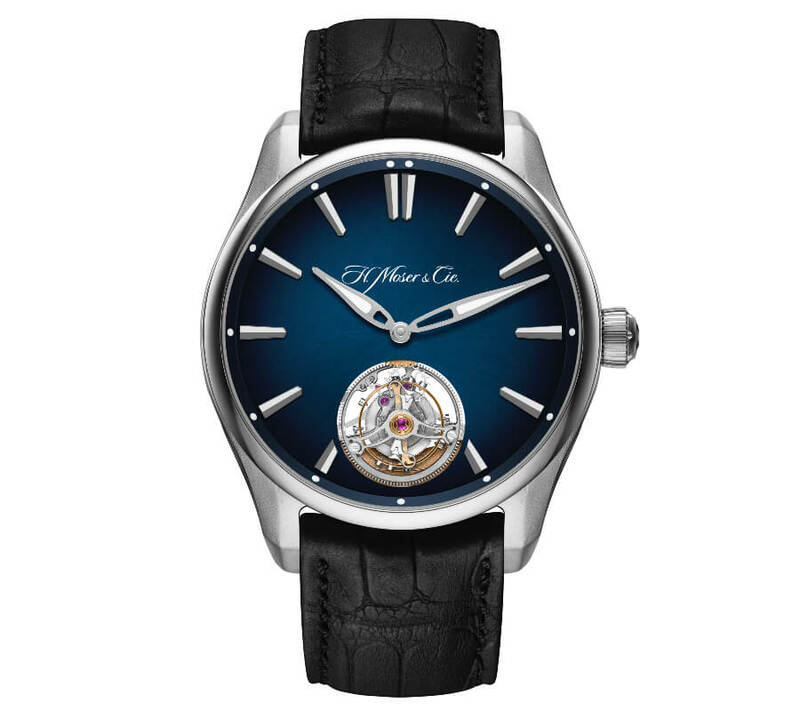 The price for the H. Moser & Cie. Pioneer Tourbillon is CHF 49,900.